We recently met around the conference table at Elliance to discuss the pros/cons of pursuing an RFP opportunity — a major state research university wanting to sharpen its brand focus and tell a better capital campaign story in order to raise a nice round $1 billion dollars. Needless to say, with that kind of money on the table, stakes are high — for the customer, of course, but also for Elliance. Although the four senior people around the table could claim a combined 70-plus years of higher education marketing and higher education branding experience, none of us had ever worked on a capital campaign of this magnitude. My colleagues read this as a well-manned checkpoint and major obstacle. Their body language suggested skepticism and discouragement. Nearly every RFP I’ve ever read includes similar language, whether written by a savvy higher education marketing VP, a web or brand or capital campaign steering committee or by the procurement office. 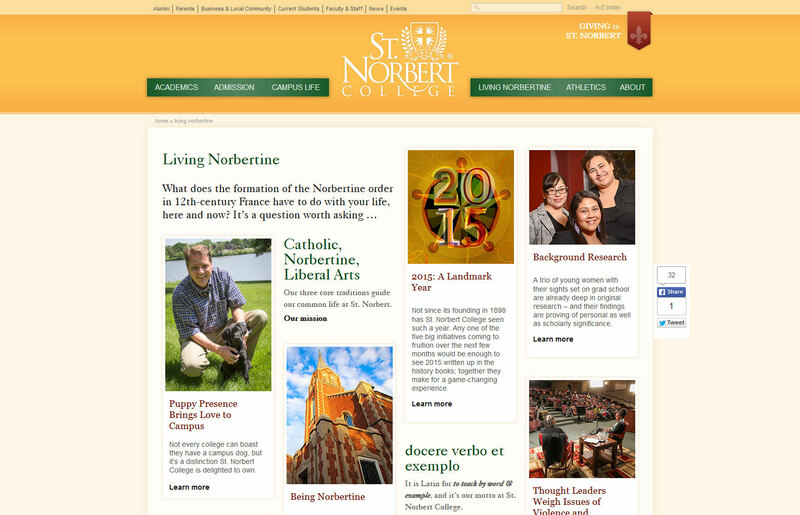 Several years back, we helped St. Norbert College in De Pere Wisconsin shed layers of past website mistakes and turn its point of view inside out — so that it spoke with verve and clarity to student needs, wants and desires. St. Norbert College opened its doors in 1898. It grew from roots in the Norbertine Order that trace back to 1120. After 30 minutes on campus, one could sense how this living, breathing culture and community understood its deep value — to mind, body, spirit — yet had never given it full voice. In many ways, that insight and those two words guided many subsequent decisions regarding site architecture, brand messaging and and overall approach to telling the St. Norbert College story. One insight and two words also formed a vital bridge connecting a new website with a parallel capital campaign. The website launched. The community rallied. Enrollment climbed. New buildings opened. New programs emerged. The St. Norbert College capital campaign met its goal in record time. To the credit of the St. Norbert College communications team, they listened closely and followed our lead. They have done a fabulous and meticulous job of preserving — and often improving — the fundamental forms, functions and messaging platforms we set forth. Experience should not be immediately equated with success. Ask any higher education marketing partners to show you a consistent and relevant trail of insights. The extra effort required to connect the dots between insight and outcome may be the most valuable time spent on a long journey toward raising a college’s reputation, enrollment, student quality or next billion dollars in major gifts.